When is the best time for Investment? You can’t wait to time or predict the market, today is the best time to start investing if you have cash. Cash is a strategic asset. The sense of pessimism is prevailing all over. Generally speaking the lifespan of investment remain for 30-40 years and to get the opportunity window for investment is bit difficult. Analyzing the Sensex in the last 20 years there has been 3-4 opportunity windows. As I wrote yesterday that the economy is currently battling twin deficits, but that is known to the markets. What will determine markets of tomorrow, are the deficits of tomorrow and expectations thereof, both of which chances are will be better and not worse than today. People tend to target only small gains over short periods. 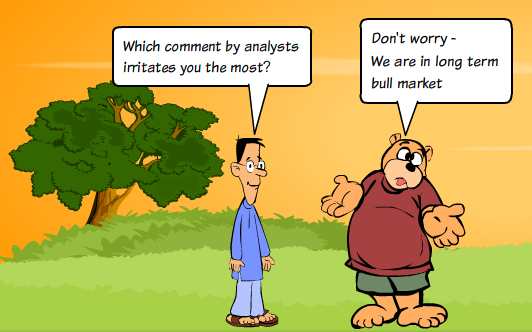 As the horizon is short-term, the entire focus is on guessing the near term market movements. This inevitably leads to extrapolating the markets in either direction and therefore, in rising markets, expectation is that markets will keep on rising. Greed of quick returns leads to higher inflows in equities and as the trend sustains, the confidence and greed both keep on increasing, leading to even larger inflows. As I quote yesterday again the Power of compounding. A majority of investments in equities are not done with a long-term view, despite the fact that the best that equities have to offer is only over long periods. This is unfortunate, as by investing with a short-term view, people are not benefiting from the compounding potential of equities.